OH Wishbone , how I loved you afterschool on PBS and how pleased I was to see you on DVD to share with my son. I almost am a little embarassed to admit that I watched Wishbone faithfully every day after school, as a high school student! I even watched Wishbone later when it was rereleased in the late 90s as an adult while I worked on my sewing projects, which ironically were also for dogs. Wishbone is not only one of the cutest jack russell terriers you will ever see but the costume quality for a dog costume was really supurb in this series. Wishbone is not just any dog, he is a dog with a really serious imagination. Wishbone dreams of some of the great literary stories and acts them out for you with a flair that only a certain jack russell terrier could! The Impawssible Dream - With Wishbone's owner Joe aspiring to make his best in free throws, Wishbone dreams about "Don Quixote"! The Hunchdog of Notre Dame - Inspired by his new friend Nathaniel who's just a little bit different, Wishbone dreams of "The Hunchback of Notre Dame". Personally our favorite of the episodes included too, Wishbone's hunchback costume is so adorable. Hot Diggety Dog - Wishbone starts dreaming of "Journey to the Center of the Earth" when digging in the yard! Paw Prints of Thieves - Wishbone is inspired when his owner Joe saves food from the cafeteria and gives it to those that need it and it make him think of "Robin Hood"! A close second in my opinion to the hunchback episode and Connor's personal favorite! Each episode not only introduces kids to some classic stories but presents them in a way that sparks their interest and hopefully will inspire them to read them and act out their own favorite books as well. After watching I had Connor pick a book from his collection and I had him help me act out small parts. He's not really ready yet for a full production but we've started introducing the idea that he can act out small parts of each book as I read them. It's a great way to get kids more involved and interested in reading! Wishbone is just fabulous and I can't say how pleased and excited I am to see him on dvd. I just hope the release follow up dvds with additional episodes on them! 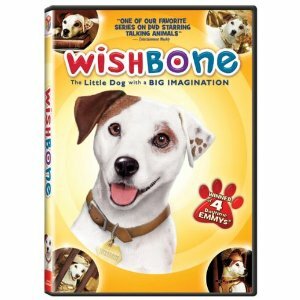 Wishbone is available right now on dvd and you can pick up your copy on Amazon ! Disclosure: We were given a copy of Wishbone free of charge, we were not compensated for this post in any other way. My opinions and comments on items we review are always my own and are never influenced by sponsors.